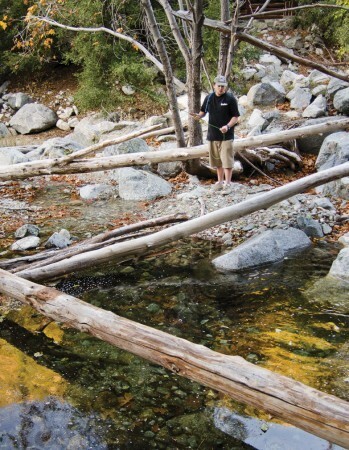 Hunting Mount Baldy’s California Rainbow Trout. Casting a line of hope, a fisherman keeps his name anonymous as his wish that his secret location in the Narrows will not be found out. This is a glorious place, especially when the sun fades behind the mountain, spawning shadows and throwing rays of light through the old Sycamores and White Alder trees. There is an abundant creek here, always restless as it splashes over the granite, creating holes and eddies. Step into this living mountain water, and it playfully splashes your boots. There is movement all around, except for the person perched on the rocks. He is like a monument in this setting, pole in hand. Suddenly, a flash of lightning strikes his line. It comes alive, pulling in a rhythmic secession of sturdy jerks and shakes. A fish has taken the bait. But this is not any fish. It is a Mount Baldy, California Rainbow Trout, and it is not one of those held in captivity at the trout ponds. It is a natural descendent of trout introduced more than 100 years ago, living and thriving in its environment, this secret world of fishing so close to home. Known as Mount Baldy to locals, Mount San Antonio harbors great habitat for the California Rainbow Trout. Although rainbow trout are not originally considered to be native inhabitants, they have taken up a stronghold in the nooks and crannies of almost every creek pool. Mount San Antonio is the highest peak in the San Gabriel Mountains located in Angeles National Forest. This offers a unique style of fishing that blends the traditional concept of fishing with line and reel with the adventure of hiking and exploration. “I have been fishing since I was a little kid,” Joseph Fallavolita, 25, of Claremont says. “I like fishing up there because it reminds me of the Sierras where my dad and I fish in the summer. Creek fishing is great because it is more adventurous, almost like hunting, seeking out places fish would be.” Because trout can be found from the San Antonio Dam, up to, and even past the Mount Baldy Village, Mount San Antonio provides plenty of space to feel at one with nature. One seldom runs into another fisherman on this winding stretch of water. The trout range in size from six inches to 12 inches long; however, Rainbows have been pulled out of secret locations weighing up to two or three pounds. The farther one treks off the beaten path, the more likely he is to find these monsters that can stretch to two feet in length. One would not need to be a pro angler to net a trout here. Anglers use fly rods, spin rods and, in some cases, line wrapped around their hands with a small hook and weight tied on, which works as well. Removing these fish from the creek can have a negative effect on the creek ecology, slowing the trout reproduction cycle and causing a great decrease in their number. 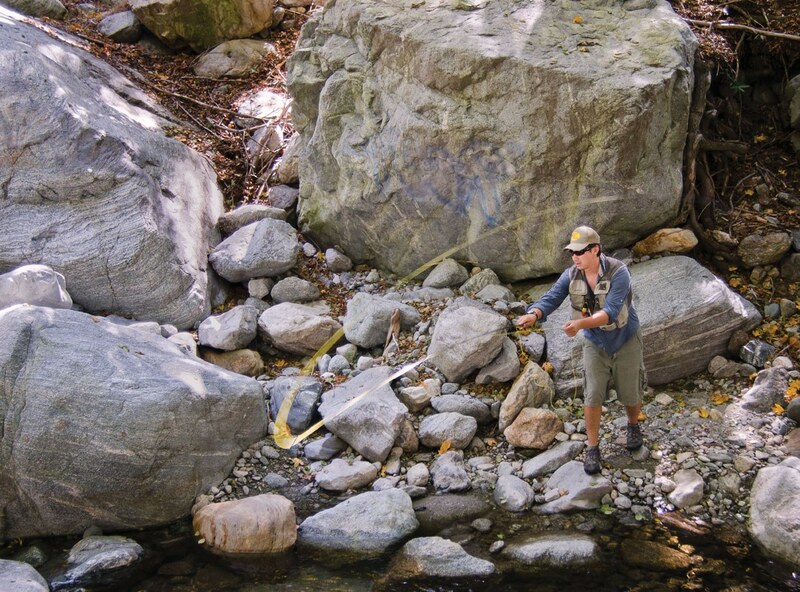 California Fish and Game regulations are enforced, which helps the sustainability of the creek, but it falls on individuals to be mindful of their impact. And, because of the overwhelming majority are of a small size, these trout would not make a good meal, so the best bet would be to catch and release. By doing this, one can ensure that there will be trout for future generations to enjoy. Introduced for recreational fishing more than 100 years ago, these California trout have greatly affected their environment. As top predators of these waters, trout eat the eggs of native salamanders and even out-compete native fish species for food. This has biologists giving mixed opinions. “There are 30 introduced species in the drainages of Southern California compared to only seven native species,” Jeffery Burkhart, professor of biology at the University of La Verne, says. “Those introduced species have profoundly altered the regional community composition and structure, generating a great deal of concern about protecting some of the native fish like the Santa Ana Sucker Fish that are endangered.” Besides the Santa Ana Sucker Fish, very few native species can be found. Most have been replaced by Rainbow Trout and German Brown Trout, which were also introduced for recreational fishing. Trout are voracious eaters and will eat anything they can fit in their mouths, from bugs, eggs, and even other fish. The best bait to use for these trout would be anything that mimics their natural food. Flies and artificial eggs are commonly used by fishermen with great success. “I’ve just started to use a fly rod,” Fallavolita says. “The flies seem to work better here because it looks like natural bait.” Crickets and live bugs work even better, provided one can procure them. Trout need a constant flow of cold water to survive. The San Antonio Creek is fed by a melting snow pack that accumulates during the winter and melts in the spring. Its temperature ranges from the mid 30 F degree range in the winter to a chilly low 60 F degrees in the summer. During the hot summer months, trout will seek out deep cold pools as refuge. If the water gets too hot, they will die. However, the moving creek stays relatively cool even in the summer months. Large numbers of trout will find cover in the creek where shade is abundant. The shade keeps the pools cold and provides shelter from flying predators. In the mid 19th century, gold mining gave way to mountain resort camps, which led to a mountain community. All have been subject to the mountain snow pack, which plays a pinnacle role in the lives of residents. Devastating floods several times have ravaged the canyon topography. During early 1938, a pair of oceanic storms swept inland across the Los Angeles Basin. The resulting 1938 Los Angeles Flood was one of most catastrophic disasters in area history. It caused the destruction of roads and bridges and wiped away scores of cabins. During fall 1966, a snow pack was so large that when the melt came, it caused the creek to flood. The rush of water was so powerful that it moved boulders the size of houses and washed the road out in many places. This prompted the building of the new Mount Baldy Road, currently in use. The Great Flood of 1969 shaped the creek into its present day look, destroying many village houses and wiping the old road off the mountain. “Many people lost their homes,” Harvey Good, professor of biology emeritus at the University of La Verne and long-time resident of Mount Baldy Village, says. The former Mount Baldy fire chief adds, “Even now, the creek will swell during the rainy months creating hazardous conditions.” Only a few remnants of the old lower road that parallels the creek still exist and can be seen in several places along the canyon. People traveling to San Antonio Creek should be aware of the dangers of the mountain. Big predators, like black bears and mountain lions live here, but they seldom run into fishermen and hikers. They are uncommon, but the possibility for an encounter is still there. “There was one time my friends and I were up there fishing,” Brandon Scott, 25, of Claremont says about a fishing trip one year ago. “We had stayed in the canyon after the sun had gone down to catch the afternoon bite. When we were walking back up to the road, we heard some rocks fall in front of us and looked up to see a mountain lion perched on the ridge, looking down on us—it was terrifying.” It is advisable to get out of the canyon by dark because this is the prime hunting time for mountain lions. Also, one should be wary of wild blackberry patches, as they are a favorite snack for black bears. If one encounters one of these predators, it is extremely important to stand your ground and appear as big as possible. If you run, it will trigger the animal’s natural hunting instinct to chase and to catch. Another potential danger is running into ornery graffiti gangs. These gangs are usually armed and do not like to be observed. One popular hangout for these gangs is known as, “The Cut,” or “The Narrows.” This area is located around Hog’s Back in Barrett-Stoddard Canyon, where the creek passes through a narrow canyon, buttressed by steep cliff walls on one side, and the road on the other. Despite the road proximity, The Cut has its rugged beauty that is marred by graffiti. The river has steep drops with big pools and mature Sycamores, pines and Alders. Good tells the story of a volunteer fireman who found out just how dangerous the gangs can be. One night, as he was locking up a fire road gate, he observed a large group of taggers spray-painting the rocks around The Narrows. “When they saw him watching them, they gave chase,” Good says. He ran to his truck, and, armed only with a radio, the fireman dispatched for backup, which promptly arrived with axes and other fire fighting equipment to “extinguish” the dangerous situation. The gangs typically operate at night, so it is important to stick to the rule of leaving before dark to avoid these dangers, says Good. Mount Baldy has its own volunteer fire department but relies on county sheriff departments that are stationed in the valley. Cell phone reception is non-existent. Sometimes, though, a text message will squeak out. Fishing is a powerfully simple reminder of our relationship with nature. It strengthens the bond between nature and our technology-captured lives. 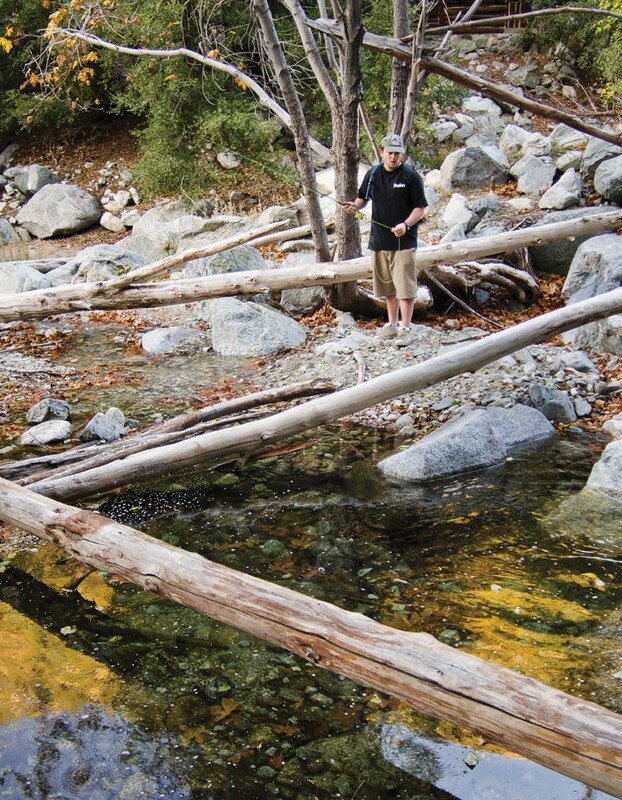 These Mount Baldy fishing areas are just 10 miles from La Verne. “It is a gem,” says Burkhart. “Baldy is a beautiful recreation area.” When you find your fishing spot, it will become a part of you. 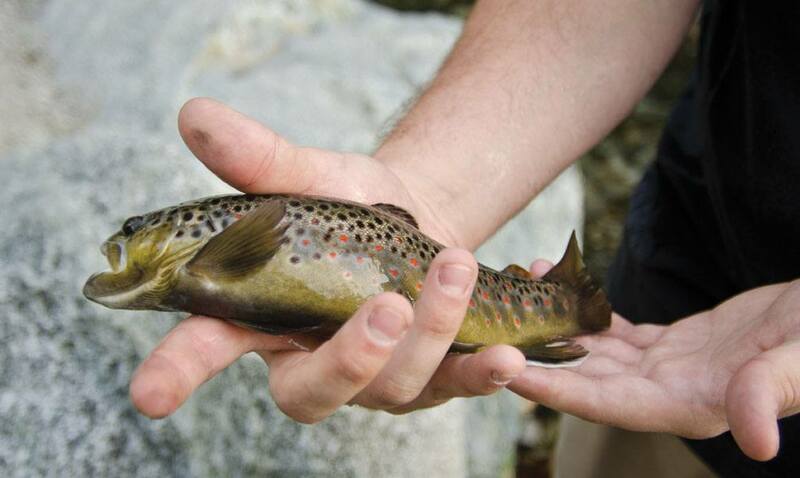 A cousin of the Rainbow Trout, this 10 inch German Brown Trout shares the Mount Baldy Creek waters and is identified by the bright orange spots that cascade along its side. Casting his luck, Joe Fallavolita, of Claremont, 25, fishes for brown trout at his secret Mount Baldy fishing hole.